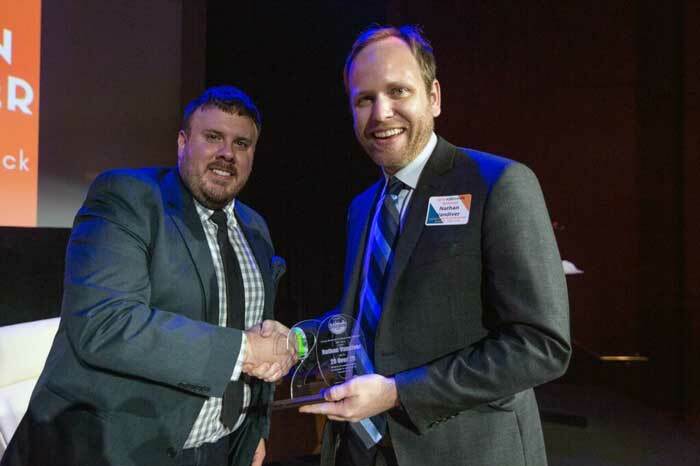 Nathan Vandiver, interim general manager and program director for UA Little Rock Public Radio, was honored with the Young Nonprofit Professionals Network 20 over 20 Award. YNPN Little Rock 20 over 20 award winners were announced at YNPN Little Rock’s CEO Talk Show on Oct. 5. The award was created to celebrate the accomplishments of nonprofit professionals over the age of 20 and establish them as the sector’s emerging or current leaders. Vandiver received his bachelor’s degree in journalism from UA Little Rock in 2011. He started his career at UA Little Rock Public Radio as an intern in the spring 2009 semester. After a successful internship, he was hired as a full-time reporter and anchor. Vandiver was promoted to interim program director in 2013 and then interim general manager in 2016. Vandiver lives in Little Rock with his wife, Julie, and sons, Henry and Charlie. Vandiver said the key to success for a nonprofit organization is focusing on the people the nonprofit serves and carrying out the organization’s mission. Vandiver also said he is impressed by his fellow award winners, who are doing a variety of work in nonprofit sectors across the board. In the upper right photo, YNPN-LR Board Chair James Rector (left) awards Nathan Vandiver (right) YNPN’s 20 over 20 Award.